The investigation of Jack Abramoff, the disgraced Republican lobbyist, took a surprising new turn on Thursday when the Justice Department said the chief prosecutor in the inquiry would step down next week because he had been nominated to a federal judgeship by President Bush. This is just wrong in so many ways. How can they get away with this? How can this administration be so brash and nobody even blinks an eye? It’s outrageous! Imagine if Ken Starr had suddenly cut short his Whitewater investigation because President Clinton had appointed him to be a federal appeals court judge? Would the Republicans have stood for that? Would the media?? How convenient. And such perfect timing! But I’m sure it’s just another coincidence. Did you know that Republicans are 10-times worse than Democrats when it comes to filling up the budget with pork-barrel projects? That’s right, 10-times worse. The Wall Street Journal spelled it all out the other day (Jan. 24) in an excellent story on Page A4 about the Expanding Bush Budgets. Wow! That still just floors me. How do they get away with it? The Republicans came to power by attacking Democrats as porkbarrell spenders wasting taxpayers’ money, and yet they have increased the practice tenfold since they took over control of the budget process. Incredible. The other thing Republicans did besides expanding porkbarrel spending 10-fold, was to redirect it away from the poor and the needy and towards their wealthy financial backers. It’s been party time in Washington ever since, with Tom DeLay flying all over the world in corporate jets to exotic luxury resorts where he plays golf and dines with the fat cats of the world. The real problem is the run-away cost of health care which has made federal spending on mandatory entitlements like Medicare and Medicaid balloon out of control. Bill and Hillary tried to warn us back in the early ‘90s, but did the Republicans listen? Noooooo. When Bush came to office in 2001, the federal budget request totaled $1.8 trillion. The expected budget request for 2007 will be $2.7 trillion. Total spending from 2001 to 2005 has risen by an average of 7 percent annually, double the pace of the previous 5 years (the Clinton years), and nearly triple the average inflation rate. And, of course, defense spending has ballooned thanks largely to Bush’s quagmire in Iraq. But even when you take out the increases in Defense and Homeland Security spending tied to 9/11, we are still seeing record levels of spending, according to Brian Riedl of the Heritage Foundation. “The brakes are off everywhere,” he says. That’s because Republican policy is to engorge themselves today and not worry about tomorrow. It’s OK if they leave the government broken and bogged down in debt, because they never believed it could work anyway. Of course, we don’t ever negotiate with terrorists. I’m sure this was just a coincidence, like they say. BAGHDAD, Iraq (AP) -- The U.S. military released five Iraqi women detainees Thursday, a move demanded by the kidnappers of an American reporter to spare her life, but an official said the release was coincidental. Yeah, sure. Let’s just hope it works and the reporter is freed. How ‘bout those Palestinian elections, huh! Hamas in a landslide! If you give the people a choice, you might not always like the outcome. It’s one of the drawbacks of democracy. So the question now is do we still support democracy in principle, even when it does not produce the results that we want? It really is unfortunate, though not surprising. Israel, through its hard-line stance in recent years, is as much to blame for Hamas’ political ascendency as Hamas was for the rise of the right-wing Likud Party. People have a tendency to get more militant the more they are attacked. It’s a vicious circle. The prospects for peace would be much better if we had a Fatah-led coalition in Palestine and a Labor government in Jerusalem. Instead we have the two hard-line factions from boths sides in power and a virtual powder keg ready to go off in the Middle East. Is the Bush administration prepared to deal with this? Fat chance. Let’s hope everybody will step back now and take a deep breath before everything is thrown into turmoil. I was glad to see that Disney and Pixar took my advice from two years ago and decided to combine forces once again. Alas, I say this only as a fan and not an investor. John McCormack has one of his typically good stories in today’s paper. It seems that a group of high-level Texas Rangers are objecting to having their esteemed organization associated in anyway with some long-haired, pot-smoking, hell-raising, liberal outlaw country singer. Never mind the fact that Willie Nelson has long been a strong supporter of law enforcement groups in Texas. They threw a hissy fit after learning that the past chairman of the Former Texas Rangers Foundation of Kerrville had posed for a picture with Nelson and sent it out as a Christmas card in an effort to promote the organization’s fundraising efforts. 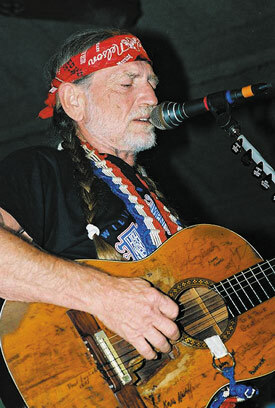 "We just have a real problem with Willie Nelson for a lot of reasons," said Capt. Barry Caver of Midland, one of nine top-ranking Rangers to complain. I don’t want to have to be too hard on the Texas Rangers, but c’mon guys, Grow Up! You sound like a bunch of whiny little girly men. Eeewwww! He smoked marijuana once! Don’t let him touch me!!! How sad. Already, this group’s pathetic whining has achieved results. Nelson has sent a letter stating that in order to avoid any controversy, he wished to withdraw his offer to perform at their July private gathering. Just as well. Let Willie play some where he will be appreciated and let the Rangers try and get someone who meets their high moral standards to come and perform at their party. I would suggest John Ashcroft and/or Orrin Hatch. These are the hallmarks of the Republican Party today. Each day there is fresh evidence of such shocking malfeasance and I am continually amazed that so many people can be so ignorant or so indifferent to it that they would continue to support this party and this administration. "It almost looks like a spoils system between various agencies," said Steve Ellis, a vice president and an authority on the Army corps at Taxpayers for Common Sense, an organization in Washington, who read a copy of the document. "You had various fiefdoms established in the contracting process." "The impression you get is of an organization that had too little structure on the ground over there, that it had conflicting guidance from the United States," said John J. Hamre, president of the Center for Strategic and International Studies. Bush gets a lot of credit for spreading freedom and democracy in Iraq that is wholly undeserved because he is unwilling to put his money (or our money, as the case may be) where his mouth is. By cutting off funds for reconstruction in Iraq, Bush has effectively thrown in the towel on this war, he just won’t admit it. As Paul Krugman noted the other day, “this administration refuses to admit defeat but has given up even trying to win.” He then goes on to relate another sad tale of Bushian incompetence relating to the persistent lack of progress in repairing Iraq’s electricity infrastructure. So why is power scarcer than ever, almost three years after Saddam's fall? Sabotage by insurgents is one factor. But as an analysis of Iraq's electricity shortage in The Los Angeles Times last month showed, the blackouts are also the result of some incredible missteps by U.S. officials. Most notably, during the period when Iraq was run by U.S. officials, they decided to base their electricity plan on natural gas: in order to boost electrical output, American companies were hired to install gas-fired generators in power plants across Iraq. But, as The Los Angeles Times explains, "pipelines needed to transport the gas" - that is, to supply gas to the new generators - "weren't built because Iraq's Oil Ministry, with U.S. encouragement, concentrated instead on boosting oil production." Whoops. More incompetence. What a surprise. And remember that President Bush was touted as the CEO president who’s Harvard education and business acumen meant he would manage the government as a tightly run ship and make sure all the trains would run on time. In November, as part of a broad budget-cutting bill, the Senate approved a measure to save billions of dollars by reducing Medicare reimbursements to private insurers. Most of those savings disappeared after the final bill emerged from House and Senate negotiations last month. That change was made in mid-December during private negotiations involving House Ways and Means Chairman Bill Thomas (R-Calif.), Senate Finance Committee Chairman Charles E. Grassley (R-Iowa) and the staffs of those committees as well as the House Energy and Commerce Committee. House and Senate Democrats were excluded from the meeting. It’s hard to know where to begin here. Suffice to say that you and I, average Joe and Jane Taxpayer, have been stuck with an additional $22 billion in Medicare expenses over the next decade because Republicans are too cozy with those K Street lobbyists. And they did it all behind closed doors, away from the public and with no Democrats around to cry foul. So please tell me again how the Republicans are the ones who are looking out for our pocketbooks as we watch the national debt continue to pile up higher and higher for the forseeable future. The truth is, the only pocketbooks they are looking out for are their own. The only way to change things is to vote the Republicans out of office as soon as possible. But then, as we saw in 2000, that doesn’t always work either. Parade Magazine, which comes in the Sunday paper, has published its annual list of The World's 10 Worst Dictators. I always find it interesting because it helps put into perspective how out of synch our foreign policy efforts are with our stated goals of spreading democracy around the globe. You have to go all the way down to No. 9 to find a country that this administration has bothered to rattle a saber at. Many of the leaders on this list and the runners-up who take up the 11-20 slots are considered our allies. That or we are indifferent to them.